A new 2020 budget proposal, once again, asks federal employees to contribute more toward their retirement as a way to find hundreds of billions of dollars in mandatory and discretionary spending cuts next year. The plan from Senate Budget Committee Chairman Mike Enzi (R-Wyo. ), which he released Friday, sets the stage for congressional and White House debates over what may be one of the toughest budget cycles in recent years. Enzi’s plan, in total, calls for $551 billion in mandatory spending cuts over the next five years. But more specifically, this budget resolution includes reconciliation instructions to five Senate committees to reduce mandatory spending levels by $94 billion through 2024. The reconciliation instructions to the Senate Homeland Security and Governmental Affairs Committee to reduce the federal deficit by $15 billion over the next five years will matter most to federal employees. Though the reconciliation instructions don’t describe the details, they suggest the Senate committee could find the savings by raising federal employee contributions toward their retirement. Federal employees last faced a similar situation back in 2017, when the Republican-controlled House of Representatives used the budget resolution process as the vehicle to propose $32 billion in cuts to the existing retirement system starting in 2018. That budget resolution passed the House, but the Senate’s version didn’t include reconciliation instructions targeting federal retirement. In the end, the House agreed to adopt the Senate’s more fed-friendly proposal. Congress had also strongly considered raising employee pension contributions to offset increases in discretionary spending under the Bipartisan Budget Act of 2015. The 2020 budget resolution comes on the heels of the President’s latest budget request, which similarly called for cuts to the federal retirement system. Unlike Enzi’s resolution, however, the White House request described a series of specific and familiar recommendations that called for higher employee contributions toward retirement and an elimination of cost-of-living-adjustments and the special retirement supplement for some federal retirees, among other proposals. Enzi’s resolution also suggests a path forward to deal with the Budget Control Act (BCA) spending caps, a discussion that lawmakers must address this year ahead of the beginning of fiscal 2020. 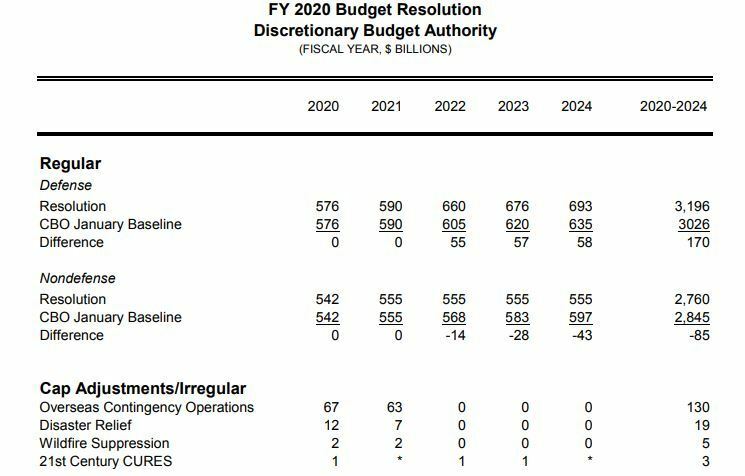 The Senate budget resolution suggests a hold on discretionary spending at the BCA caps for 2020 and 2021 for both civilian and Defense agencies. By 2022, defense spending would go up and over the BCA cap for that year, while non-defense spending would be frozen at 2021 levels. That’s a dramatic turn from the $597 billion figure Congress recently implemented for non-defense agencies in 2019, for a drop of 9 percent. But the Senate resolution leaves the door open for another option. Enzi’s proposal differs from the President’s most recent request, as the White House proposal similarly cut civilian agency spending by 9 percent but included a 5 percent increase in defense spending in 2020. Again, the Senate proposal doesn’t suggest how specifically agencies should cut discretionary spending but recommends appropriations committees “be mindful of funding programs that have been highlighted by [the Government Accountability Office] as being duplicative, overlapping or fragmented,” the resolution’s overview reads. In addition, the Senate budget resolution recommends $176 billion in revenue changes, in part, through increases to federal employee retirement contributions and receipts from changes to other mandatory and regulatory programs. It also suggests the addition of reserve funds, which would allow the Budget Committee to essentially fund certain priorities without running up against Budget Control Act caps. The Senate Budget Committee is expected to markup the resolution next week.